The view from Orchard Barn in Arnside takes in the Yorkshire Dales, the Howgill Fells and the Lake District. Looking at the beautiful, ancient orchard you wouldn’t believe that twenty years ago it was an overgrown bramble patch. When Peter Goulder and Sheila Porter came to look at the ruined barn at the top of Briery Bank, they decided they’d take on the restoration of both that and the neighbouring orchard. Peter says: ‘When we first saw the orchard, it was so overgrown with brambles that we had no idea how far back it went. There were brambles in every tree.’ It took two years of back breaking work to clear the brambles before the orchard restoration could even begin! We know there has been an orchard on the site since the 1750s, but the current orchard originates from a replanting by local people Thomas and Ellin Whinrey in the 1890s. Over almost 20 years Peter and Sheila have returned the orchard to its former glory and continue to maintain it. Wherever possible, the couple have retained the old trees, and replant with local and historic English and Scottish apple varieties; including such wonders as Peasgood’s Nonsuch, Keswick Codlin, Scotch Bridget, Red Bramley and St. Elfin’s Pippin. The orchard is now home to 67 heritage varieties of apple as well as pear, plum, gage, mulberry and damson trees. Nurturing heritage varieties does require more work than growing modern apples. The trees at Orchard Barn occasionally become diseased with conditions like canker, which have been bred out of the more modern and tasteless varieties we see in supermarkets. Peter and Sheila also carry out their orchard maintenance by hand and do not use any pesticides, herbicides or fertilisers. 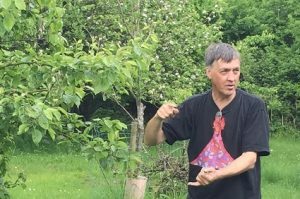 As well as their commitment to growing heritage fruit varieties, Peter and Sheila also promote wildlife habitats in the orchard, leaving dead wood for creepy crawlies to make their homes in, and areas of long grass to attract voles. Orchard Barn produces delicious apple juice for sale at Ramblers on Arnside Promenade, in the café at RSPB Leighton Moss and at Levens Hall. Peter and Sheila have hosted Arnside & Silverdale AONB’s biennial community Apple Day celebration at Orchard Barn since it began in 2005.